In March 1851 Englishman Edward Hargraves announced in the Sydney Morning Herald that he had found gold just outside the New South Wales town of Bathurst. By July, reports came of good finds at Clunes and Anderson’s Creek near Warrandyte in Victoria and, by the end of 1851, the rich deposits at Ballarat, Bendigo and Mount Alexander had been discovered. The rush to be rich was on. Men from all over the country left their jobs, homes and families and flocked to the Victorian diggings. Melbourne dissolved into chaos. Prices soared as the city teemed with eager gold-getters. Businesses shut down as their employees deserted en masse. Newspapers closed and banks were stripped of cash to buy supplies. Deserted wives and families struggled to pay for basic food and clothing. Object property of National Library of Australia. This painting by William Strutt shows the unusual position that the women of Melbourne found themselves in shortly after gold was discovered. Without men around to perform traditional male tasks, the women filled their shoes and chopped wood, fetched water and mended houses as required. By 1852 news of the Victorian gold discoveries had reached the rest of the world. In Britain thousands competed for berths to Australia and every available ship, seaworthy or not, was rushed into service. 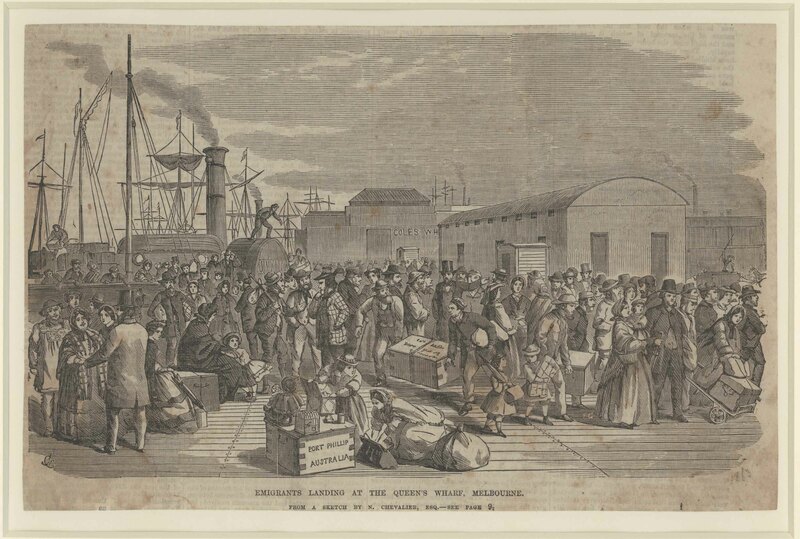 During 1852 alone, 45,000 passengers from Britain arrived in Victoria: 29,000 were unassisted, mostly gold-seekers. They were soon joined by thousands of immigrants from Europe, America, China and New Zealand, keen to try their luck. Between 1852 and 1861 over 340,000 people arrived, often enduring appalling conditions on overcrowded ships. 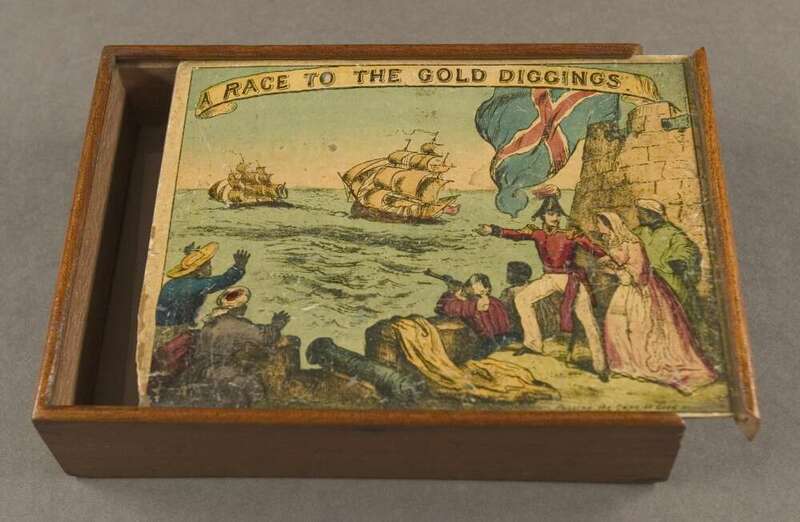 Race to the Gold Diggings of Australia - a game of chance! The excitement of the gold rush found expression in many different ways. Eager readers pored over newspaper accounts and there was a ready market for guide books, first-hand accounts from travellers and advice columns. Theatrical performances were put on and works of art were created: there were even games for children, like the one on display in the exhibition. Race to the Gold Diggings was made in London 1855. 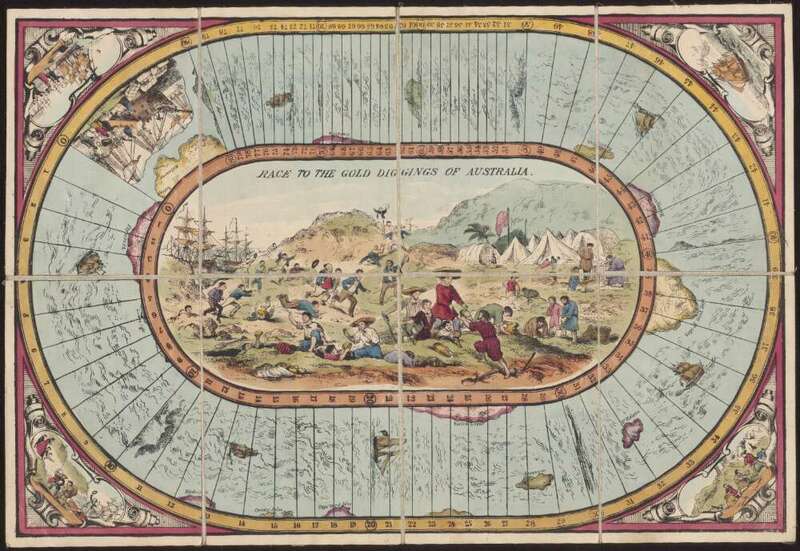 On loan from the National Library of Australia, it is the earliest-known board game that has Australia as its theme. Players left Plymouth in England, sailing around the Cape of Good Hope in Africa to Port Phillip Bay. They used counters in the shape of sailing ships. The first player to negotiate the perils of the sea voyage and land safely at Port Phillip was the winner and was rewarded with a trip to the goldfields where he or she [of course] found gold. Created at the height of the Australian gold rush, this was just one of many products at the time that left would-be diggers with the impression that finding gold was easy. The pictures in the corners of the board show different aspects of the mining experience – the journey to Australia, success on the diggings and bags of gold! 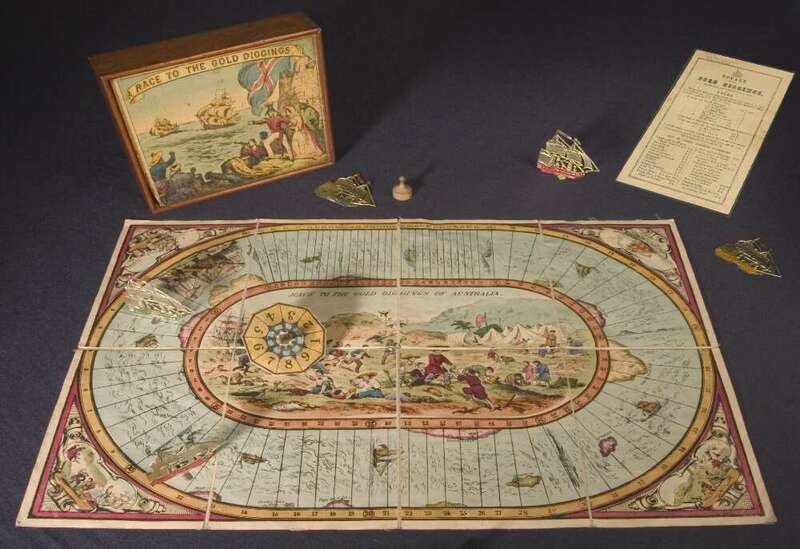 (ABOVE LEFT) The brightly-coloured game board - a linen-mounted, hand-coloured lithographic sheet. (ABOVE MIDDLE) The game comes in a painted wooden box with a sliding lid. The illustration on the box lid shows ships Passing the Cape of Good Hope. 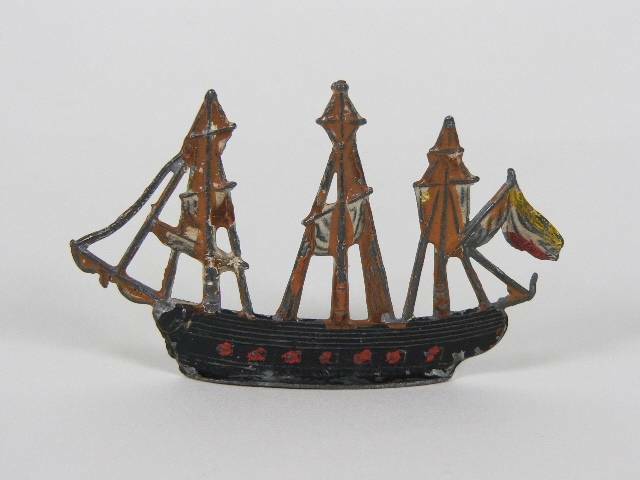 (ABOVE RIGHT) On display in the exhibition are two of the original six painted metal ship counters.